This salad is composed mostly of healthy carbohydrates. Serve it as a side to a meal made up of protein and some fat to make it balanced and to stabilize your blood sugar. It’s also a great dish to bring to a potluck or bbq! Bring water and raw buckwheat to a boil in a saucepan. When water boils, cover saucepan and reduce to a simmer until liquid is absorbed (about 10-12 minutes). Place cooked buckwheat in a colander, rinse, and cool completely. Whisk lemon juice, zest, oil, salt and pepper in a small bowl and set aside. 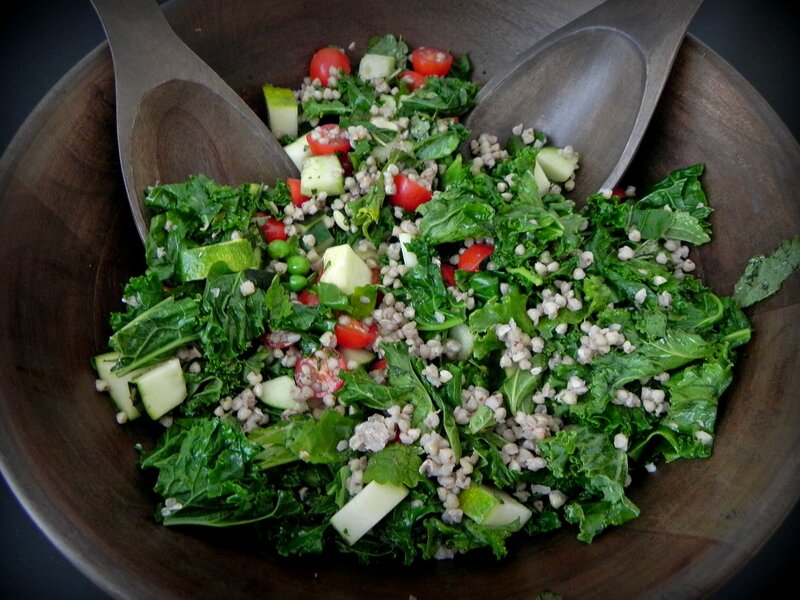 Add kale, peas, tomatoes, zucchini, and cucumber to a large bowl. Toss with dressing. Add buckwheat and herbs and toss until fully combined. Store in refrigerator until ready to serve.